SOBuzz: Getting Ready for Fall… Painting! For a studio owner, getting ready for fall classes means a lot of things… piles of paperwork, phone calls and emails to return, attendance sheets and class signs to prepare. For me, it also always means painting the studio! It seems like every year I end up painting one or more of the rooms. Maybe it's just me, but I get very anxious when selecting a new color to paint the studio. Perhaps it's because I will be spending the next two or three years (if the paint is good) staring at the wall color, who knows? Although I do fine choreographing formations, I'm not a very good visualizer of the end product. I need something more. I used to get a bunch of little samples, tape them to the wall and deliberate for a week, asking everyone who walked by whether "summer white" looked nicer than "classic beige". But wait, there's a solution! My favorite tool to use before painting is Sherwin William's "Color Visualizer" tool. 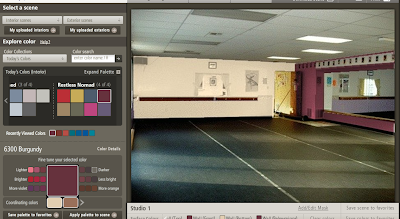 You can upload a picture of any room and "paint" using their colors. Now I can digitally "paint" my rooms and change them around as much as I like before purchasing paint! Hooray!